Could China send Commodities Higher? Citi Analysts believe that there could be positive demand growth for China-sensitive commodities in 2018, as the Chinese government pushes through their reform policies. Oil – In recent years, China has made up the dragon's share of global oil demand growth. Recent Chinese oil demand data suggest that growth rates could be reaching a higher level for key oil products. Demand for Chinese diesel looks to be growing rapidly while demand for gasoline looks steady. Base metals – Chinese fundamentals could be supportive of base metals in 2018 and recent price strength looks to be due to global growth. Chinese copper consumption growth ended up higher than expected in 2017, supported by strong air conditioner sales and power cable growth. Meanwhile, Citi Analysts believe aluminum demand growth in 2018 could moderate to ~6% year-over-year compared to 8% year-over-year in 2017. Given expectations of strong inflation, Citi Analysts think the current environment could still be supportive of commodities. 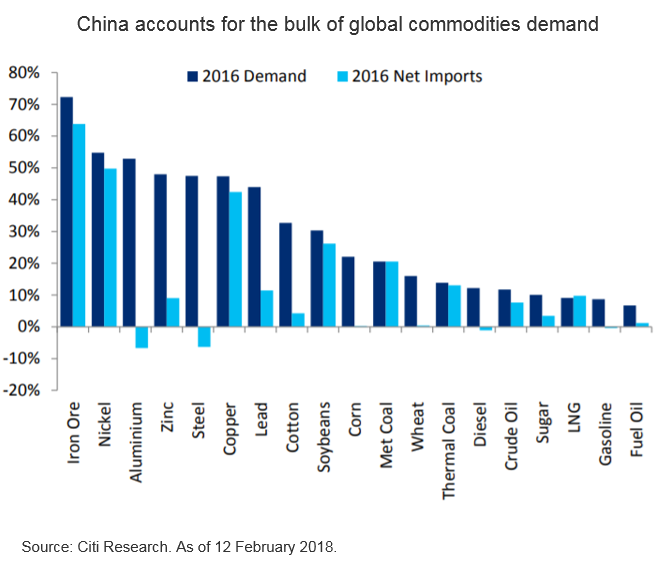 With economic growth and fixed asset investment expected to slow in China this year, Citi Analysts also prefer commodities that are likely to be driven by consumer demand, which includes zinc and copper.